Individuals looking for a Southern Utah home in Ivins quickly become aware that it is a world-famous city due to its Red Mountain Resort, known for its wellness and fitness spa. Other people searching for a Southern Utah home love Ivins because of its breathtaking red rock views, endless paved bike trails, quick access to Snow Canyon National Park, and our Broadway play and musical outdoor amphitheater, Tuacahn. 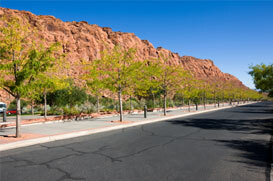 This community offers homes ranging from very affordable / starter home to luxury homes.